The da Vinci™ Surgical System is the next generation of surgery: precise, minimally-invasive procedures that can mean less trauma, blood loss and hospital time for the patient. Hartford Hospital is currently performing da Vinci procedures in urology, cardiology and women's health. In addition to Dr. Wagner, physicians who perform robotic prostatectomies and urologic procedures are Drs. Steven Shichman and Stuart Kesler: physicians who perform robotic cardiac procedures are Drs. David Underhill and Robert Gallagher; and physicians who perform robotic gynecologic procedures are Drs. Christine LaSala, Paul Tulikangas, Amy Brown and Adam Steinberg. A surgeon at the operative console (foreground) views continuous, 3-D video images from inside the patient and controls the robotic instruments (background). The da Vinci® Surgical System allows surgeons to perform minimally-invasive procedures as if they were performing open surgery, but without the fatigue experienced in a long procedure. The patient may benefit from reduced bleeding, less pain, smaller risk of internal scarring, shorter hospital stay and a shorter recovery. Unlike the robots of science fiction, the da Vinci Surgical System can't make decisions on its own. It can't even be pre-programmed. The da Vinci robot allows the surgeons hand movements to be scaled and translated into precise movements of the tiny instruments in the body. The da Vinci System enhances surgical capabilities by enabling the performance of complex surgeries through tiny surgical openings. As of January, 2014, the hospital has eight surgical robots: four in our operating rooms, three in CESI (our Center for Education, Simulation and Innovation) and one in Research. 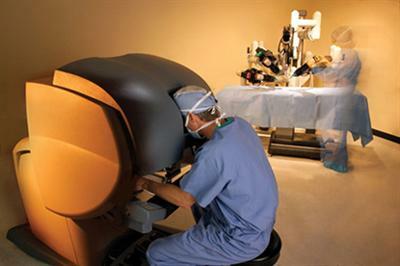 Learn more about the da Vinci® Surgical System robot. The robot's EndoWrist™ robotic instruments reproduce the movements of the human hand, wrist and fingers. EndoWrist® Instruments reproduce exact movements of the human hand, wrists and fingers. Extensive range of motion allows precision suturing, dissection and tissue manipulation. One of the InSite Vision System 3-D video cameras. InSite® Vision System dual 3-chip digital cameras take surgery "inside" the patient. The only system with true 3-D vision offers depth of field and resolution. 3-D image aligned over the master controls provides natural hand-eye coordination that is inherent in open surgery. In April, 2012, a team at Hartford Hospital became the first in the State of Connecticut to perform a single incision, robot-assisted gallbladder surgery which has been recently approved by federal regulators. The procedure takes only about an hour and has a typical inpatient stay of less than 24 hours. Led by surgeon Darren Tishler, M.D., the team removed the diseased gallbladder by manipulating robotic arms through a single, inch-long incision in the belly button. Combining robotic surgery with a single belly-button incision requires advanced training and technology. “It’s my responsibility as a surgeon to provide patients with the most up-to-date surgical options,” says Dr. Tishler, one of a small group of surgeons in the country who have performed the surgery. “The robot’s dexterity is equivalent to laparoscopy, but its main advantage is the crystal-clear visualization,” he says. The surgical robot’s versatility allows Dr. Tishler to sit at a nearby console, using joysticks to control the instruments as he visualizes the entire surgical field on a 3D display. In real-time, the system translates his movements into precise manipulations of miniaturized instruments inside the patient. Learn more about Robotic Gallbladder Surgery. Learn more about Open Cholecystectomy (traditional gallbladder surgery). Hartford Hospital cardiac surgeons were the first in Connecticut to harness the power of robotics in cardiac surgery. Mitral valve repair using da Vinci is just becoming available at Hartford Hospital. It is an alternative to conventional open heart surgery – the traditional way to treat mitral valve disease. Internal Mammary Arter (IMA) dissection. The IMA is used as the bypass vessel for bypass procedures. Atrial septal defect closure. Atrial septal defect is a congenital abnormality of the upper chambers of the heart (atria). As a result of this defect, the wall separating the right and left chambers does not fully close. Surgery is sometimes used to correct this condition. Hartford Hospital surgeons hope to soon begin performing coronary bypass surgery using small left-side incisions. The da Vinci prostatectomy is performed with the assistance of the da Vinci Surgical System – the latest evolution in robotics technology. It is robot-assisted, minimally invasive surgery. It is quickly becoming the preferred treatment for removal of the prostate following early diagnosis of prostate cancer. In fact, studies suggest that da Vinci prostatectomy may be the most effective, least invasive prostate surgery performed today. The da Vinci Surgical System enables surgeons to operate with unmatched precision and control using only a few small incisions. Recent studies suggest that da Vinci prostatectomy may offer improved cancer control and a faster return to potency and continence. Traditional open surgery has been the "gold standard" approach to many gynecologic procedures. At Hartford Hospital, many procedures for women are now performed with an assist from the da Vinci Surgical System robot. Surgery for early-stage ovarian cancer. TOTAL hysterectomy with oophorectomy (removal of the ovaries) and pelvic and para-aortic lympphadenectomy for endometrial cancer. Hysterectomy with removal of the ovaries for patients with increased genetic risk of ovarian cancer. Hysterectomy with or without removal or the ovaries for carcinoma in situ of the cervix. Hysterectomy for endometriosis or fibroids in selected patients. Click here to learn more about robotic hysterectomy. The following video will help you learn more about Robotic Prostatectomy at Hartford Hospital.